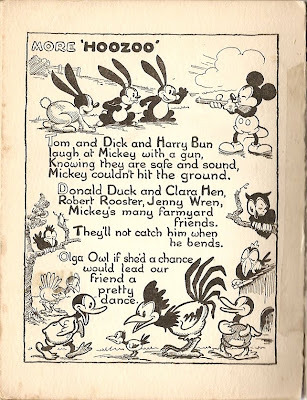 In an earlier post at this blog on Dec. 2d, 2008, I had extensively covered what I call as Donald Duck's "pseudo-debut" in the illustrated story book The Adventures of Mickey Mouse (1931) where he was named as one of Mickey's barnyard friends. Next year, Donald Duck would also get a mention in a British publication. 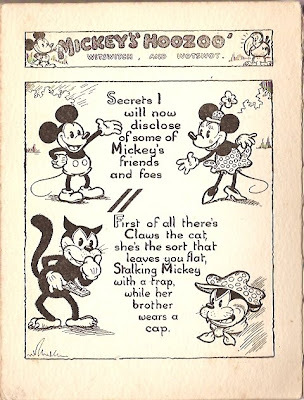 An 8-pages illustrated text piece titled 'Mickey's 'Hoozoo'' in the third Mickey Mouse Annual (1932) introduces several of "Mickey's friends and foes" and Donald Duck gets a one-time mention in the third page (scan above). 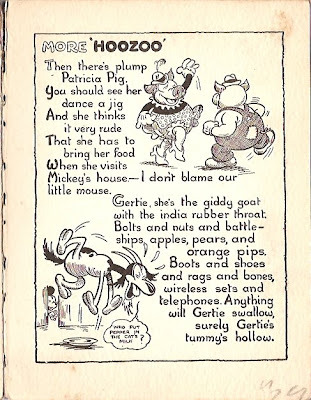 'Mickey's 'Hoozoo'' is partially partially derivative of The Adventures of Mickey Mouse which had a British edition as well. 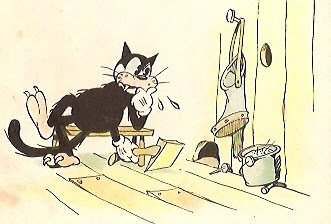 The Adventures of Mickey Mouse has a plot while 'Mickey's 'Hoozoo'' is just a collection of sketches and the latter includes several characters not mentioned in the former, but there are several obvious connections, beginning with the fact some of the illustrations in the British annual are clearly copied/redrawn from the US book, such as the cat figure in the first page.. 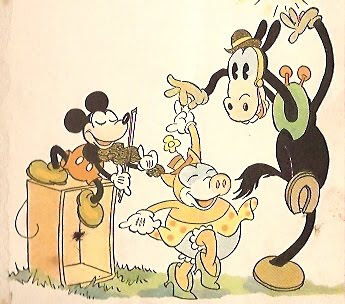 Equally significant is the fact that the character known today as Horace Horsecollar is named as Henry Horse and Clarabella Cow as Carolyne Cow in both publications. Hence, the inclusion of Donald Duck in the third Mickey Mouse Annual can be explained by its derivative relation to The Adventures of Mickey Mouse.